Economic Development Minister Ebrahim Patel addresses the IDC’s 2015 results presentation. 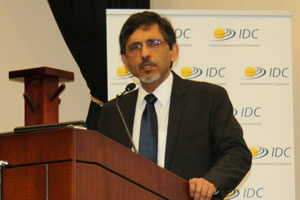 Facing tough economic times globally and locally, South Africa – and the IDC as one of its key development finance institutions – must diversify and focus on opportunities in three key areas, Economic Development Minister Ebrahim Patel argued at the IDC’s 2015 annual results presentation. The IDC is something of a barometer for the South African real economy. Its portfolio is concentrated in critical traditional sectors such as mining, steel, chemicals and textiles; and in new sectors such as green energy and film. Its portfolio has a particularly strong exposure to the tradable goods sector: to those parts of the economy where growth is a function of exports or where a significant part of the market is in sectors exposed to import competition. In this context then, the IDC, like the economy as a whole, faced a year of growing headwinds that the institution had to navigate. China’s growth slowed sharply during the past year and Chinese demand for key mining commodities dropped, pushing prices down and decreasing physical output. European growth remained weak and demand from elsewhere was not sufficient to maintain robust global growth rates. The impact on the IDC is twofold: it has impacted on the financial returns of companies in which the IDC is invested; and it has placed some of the companies in the portfolio under pressure. Examples of the first are Kumba and Sasol, whose returns have dropped against the recent trend-line and the heights of the commodity-cycle. Examples of the second are the investments in Scaw Metals and Foskor, both of which had challenging a year. I am pleased though that in this complex and tough economic environment, the institution can register successes and indeed turned in a very credible performance. Even in these tougher times, profit after tax is marginally up. In the past year, when many companies held back on new investment due to market uncertainty, the IDC (excluding from its wholly-owned subsidiary sefa) approved R11,5 billion for new projects and disbursed R10,9 billion to project partners for investments that had already been approved. The largest portion of that funding, R5.2 billion, was destined for the manufacturing sector, providing an investment boost but also showing our confidence in the future of manufacturing in South Africa. IDC investments created just over 20 000 new jobs. Investment approvals excluding the renewable energy sector rose from R7,1 billion to R10,7 billion in the past year, a growth of 51%. This was mainly in gas, manufacturing and manganese mining. I make this point to show that in stormy times, the IDC’s role is to find investments still worth backing. Indeed, in 2009, during the global financial crisis, IDC support was critical to save many companies in distress and the IDC provided a range of support, from new funding to companies facing a sharp reduction in funding from their traditional sources, to providing supportive terms for clients of the IDC whose markets had contracted overnight. In that period the IDC provided about R6 billion in support to vulnerable companies and the wisdom of it became evident as most of the companies recovered well and not only paid back the IDC but in some cases expanded their companies and created new jobs. A good example of this was the support provided to Bell Equipment, a yellow-metals manufacturer; and to the local factory of Ford. Today, both companies are major exporters of rolling stock and one of every five Ford ranger bakkies are sold to other African countries. Weaker global economic growth globally has affected domestic growth. In light of these headwinds, we need to diversify and focus on opportunities in three key areas: the first is expansion opportunities on the rest of the continent; second, in manufacturing for the SA market through sharper competition to wrestle back parts of the domestic market that was lost to imports; and third, through expanding the economic dividend of infrastructure investment. I am pleased to note that the bulk of IDC funding, some 92%, was for facilitating industrial expansion and growth, with 52% of funding allocated to greenfields investments and 40% for expansions in existing enterprises. South Africa’s fastest growing markets for manufactured-exports was to the rest of the continent. Companies in the IDC stable benefitted from this and it helped to mitigate weaker demand from other parts of the world. However, there is still scope for further growth in exports to neighbouring countries and a concerted effort is needed to maintain the growth-rate of African exports. In addition to the direct benefits that SA companies receive from exporting to the rest of the continent, the IDC also invest heavily to support African growth, seeding the ground that can provide for development and future growth. In the past year, the IDC approved investments of R1,8 billion in 10 other African countries. Many of these investments are in basic infrastructure, tourism and mining. The steel industry has seen a sharp rise in imports from Asia. Government has approved increased tariffs on three steel products and we are evaluating the case for further products to be provided with tariff support. As we do so, we send a signal that we will do what is necessary to assist companies to weather the storms and headwinds. But we are also sending a message in our talks that companies need to invest in their competitiveness instead of relying simply on trade measures. Such investment includes upgrading plant and equipment and improved maintenance of the existing productive capacity, but it also embraces investment in better workplace relations. We are pleased therefore that business and labour are working together at sectoral level to address the immediate challenges. The IDC stepped in at Highveld Steel when the company was threatened with closure and provided a facility of R150 million to give the company the breathing space to find a new technology and equity partner. I am pleased to note that the discussions on Highveld Steel has progressed constructively. The Business Rescue Practitioner solicited bids from new equity partners for the company based on keeping it as a going concern. More than one serious bidder was identified and detailed discussions have now been concluded with the bidders. The BPR will make an announcement on Wednesday of the successful bidder and we are advised that the new owners will invest heavily in Highveld Steel to modernise its industrial base. These two examples: of tariffs increases and provision of industrial funding, illustrate the efforts to hold onto our industrial capacity. But they point also to opportunities to expand production for the domestic market. 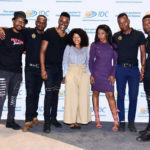 The IDC investment in the clothing, textile and footwear industry has been synchronized with a government-funded partnership with the industry to improve its competitiveness, through new equipment and machinery at local factories. In the past few years, these interventions have not only stabilized the sector but in fact have led to more than 6 900 new jobs at factories participating in the competitiveness programmes. Infrastructure investment remains a key way in which government can support economic growth. The public sector and state-owned companies are investing about R1 billion per working day in infrastructure. The IDC played a prominent role in one part of the National Infrastructure Plan, namely through support for the renewable energy build-programme. When the IDC entered this space, there was a high level of skepticism by traditional funders who feared that government would not be able to pull off its renewable energy programme or that implementation would be weak. Over the past four years, the IDC invested about R14 billion in wind, solar and hydro projects and helped to create a market, to the point that the IDC can slow down the growth of its investment in green energy because market appetite for the sector is now very developed. It will stay in this investment space because it is necessary for the economy, but it can now focus more on other sectors of the economy and other parts of infrastructure. The development of a component manufacturing industry able to leverage off our infrastructure spending is important. It is a source of industrialisation and growth. In the past year, the IDC supported a number of projects to localize component-supply. For example, the IDC provided a R200 million guarantee and a R20 million loan for a company that will fabricate and supply the complete car-body structures for 240 locomotives in Vereeniging for a Transnet rolling-stock procurement programme. Another example is IDC support to a black industrialist to acquire shares in a large bus-making company that manufactures buses for the Bus rapid Transport system for the infrastructure programme. What these examples show is that a focused localization programme can help to provide new industrial capacity and increase the jobs in manufacturing. 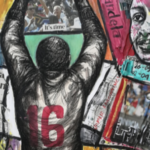 Empowerment remains an important focus for the IDC, not only for reasons of historical redress but as a fundamental requirement for long-term, sustainable growth. In the past year, the IDC approved R5,9 billion for projects that had significant presence of black shareholders, what the IDC calls black-empowered and black-owned companies. Some 41 black industrialists were supported during the year with funding. In May this year, I announced a new R23 billion Fund to support black industrialists. The Fund provides concessional funding to black industrialists in the productive sectors of the economy. We launched this Fund to ensure that access to capital would be available for projects with economic merit and this will now be combined with other government programmes to ensure that we boost participation by all South Africans in the economy. Funding for youth-owned businesses by the IDC was R159 million in the past year, and adding sefa youth-funding, the IDC family provided R468 million for youth entrepreneurship. While it is a start, it remains too small against the enormous need we have to bring young talent into the economy as entrepreneurs, as job creators, as inventors of new products. I have therefore met with the IDC management to identify ways in which youth-entrepreneurial funding opportunities can be identified more rapidly and supported not only with funding but also with preparation of viable business plans. I am pleased to note that support for women-empowered businesses rose very significantly in the past year, with R756 million approved last year, a growth of more than 130% compared to the previous year. During the past year, the IDC’s level of impairments came down, measured as a percentage of the cost of investment. This is partly due to better management of the investment portfolio and the benefit of a rebalanced portfolio. It is important as part of ensuring a sustainable development finance institution as the IDC prepares to celebrate its 75th anniversary this year. But the reduction in the impairment also helps to stock up the IDC toolkit for the more challenging times that the economy faces. The IDC has many excellent products and a pool of technical skills that can be used to mitigate against the global headwinds, and sometimes to find tailwings that can benefit the economy. In the year ahead, the IDC will put more effort into communicating these facilities to a wider audience of potential and current investors and they are now on a major domestic road-show to showcase what the institution can offer. The IDC is also deepening its contact with existing clients, monitoring the impact of slowing growth on their businesses and supporting them through this period. I conclude with a few words of thanks. First, to the Chairperson of the Board of Directors, Ms. Busisiwe Mabuza and her Board of Directors for providing guidance to the IDC. I also warmly thank the previous Chairperson, Ms. Monhla Hlahla and the other directors who retired during the year for their dedicated service to the Corporation. Second, to the CEO Geoffrey Qhena who is one of the country’s most experienced industrial financiers and a good captain to have at the head of a ship that navigates its way through the stormy times. I also thank the staff who are dedicated and professional and who are the first-line of contact with investors and entrepreneurs. A thank you in particular to Gert Gouws, who has completed his last term as CFO and who has been replaced by Ms Nonkululeko Veleti, who I wish to welcome to the IDC family. Gert’s skills will be retained in the IDC so that we can continue to tap his institutional memory and his experience in the organization. Finally, to the members of the media for helping to communicate the IDC story to the wider public, so that in times when some public institutions are under pressure, we can celebrate the strong institutions that we indeed have.